Stains on asphalt roofing shingles make a house look shabby, which detracts from its value. In some cases, stains are merely a cosmetic issue. But sometimes they’re symptomatic of a problem that, if left unchecked, can lead to more serious damage and, eventually, roof failure. It’s not always hard to distinguish the causes of stains, nor, in most cases, to get rid of them and prevent the stains from recurring. Eroded mineral surface. If the roof-covering material has been on the house for 15 years or so, it could be that the surface granules are wearing off the shingles and the asphalt base is starting to show through. On older roofs, you may additionally see cracked and/or shingles with curled edges. If you determine that age and wear are the causes of darkening, it may be time for a new roof. Algae growth. More often than not, blue, green or black stains on an asphalt-shingle roof are caused by algae. Algae staining begins with small spots which, over time, can develop into streaks. Algae stains, which are often mistaken for mold or mildew, aren’t harmful to anything other than the appearance of asphalt shingles, but nobody likes the look. Moss. Green, velvety masses of moss often grow on north-facing roof surfaces and on tree-shaded roofs. Unlike algae, moss left on roof surfaces can develop beyond an aesthetic problem. 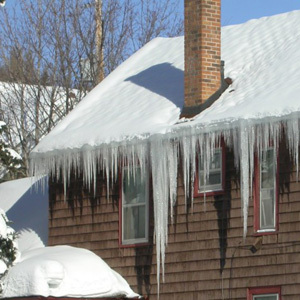 It can infiltrate the roof structure underneath the shingles and make their edges lift and curl, which can lead to cracking and blow-off during high winds and storms. Heavy moss growth can actually form dams that can cause water to back up under the shingles and damage the roof deck. It’s best to clean moss off a roof as soon as you notice it’s growing there. Both algae and moss can be easily removed from asphalt shingles with a 50/50 solution of chlorine bleach and water. Laundry-strength bleach is sufficient, or you can opt for any of a number of proprietary roof cleaners, some of which don’t contain bleach, lye, or other potentially harmful chemicals. Wait for a calm, windless day to clean your roof. Spray landscape plants near the house with water and cover them with tarps to protect them from chemical overspray and runoff. Wear protective clothing, including long sleeves, pants and gloves, as well as goggles to protect your eyes, and shoes with high-traction soles. Before climbing up to clean stains from your roof, be aware that about 30,000 people fall off ladders and roofs each year. 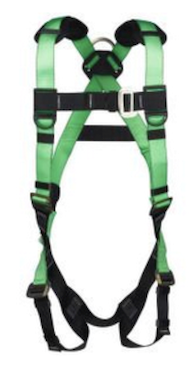 Consider using a safety harness, just as the pros are required to do, and follow the common-sense rules for properly positioning and using a ladder, which can be found in InterNACHI’s article on ladder safety. Also, be sure to notify someone that you’ll be on your roof. In case of an accident that incapacitates you, you’ll want someone to know where to look for you. Apply the bleach solution with a garden sprayer. Let it stand on the surface for about 20 minutes, then rinse it off with spray from a garden hose. Don’t let the bleach solution stand on the roof for more than 30 minutes or so without rinsing. And don’t use a pressure washer, which can damage the shingles by removing their protective layer of asphalt granules. If accumulations of algae or moss are heavy, at least some of it should wash off the roof surface right away with the stream from the hose. You can try brushing off algae and moss with a brush or broom with medium-stiff bristles, but don’t scrub too hard. You don’t want to separate the mineral granules from the shingles. If chunks of algae or moss or heavy stains remain on the surface after rinsing, let the roof dry, then spray on the bleach solution again. Wait 30 minutes and rinse. Don’t worry if some staining remains after the second rinse. It should wash off over time with exposure to rain and sunlight. Algae and moss tend to grow roof surfaces that are shaded and retain moisture. So, it’s a good idea to cut away tree branches that overhang the roof and block sunlight. Keep the roof surface clean by blowing off leaves and fallen branches during seasonal maintenance. to prevent algae and moss growth. 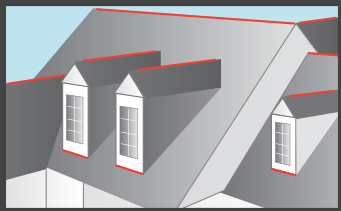 For long-term stain prevention, have zinc or copper strips installed under the cap shingles, leaving an inch or two of the surface exposed at roof peaks, along hips, and under the first course of shingles at the base of dormers. Copper and zinc are sacrificial metals that shed tiny bits of their surface with each rainfall. The metals coat the roof and inhibit organic growth for many years. Following these maintenance tips can help homeowners enjoy an attractive roof. They can also help extend the roof’s service life, which is important whether you plan to stay in your home or sell it in the future. All GFCI outlets have one little-known flaw: their circuitry eventually wears out, usually after about 10 years, at which point they no longer function properly. The reset button alone won’t tell you if a pre-2006 GFCI outlet is still working properly—you’ll need to check it with a special tester. Your new GFCI will never require a circuit tester. All GFCIs manufactured after mid-2006 are designed to tell you when they fail. The vast majority indicate failure by shutting off power permanently. So someday your GFCI (and any other outlets connected to it) will simply stop delivering power and you’ll have to replace it. Two-thirds of all electrocutions in U.S. homes could be prevented if people installed the receptacles. A ground fault happens whenever electricity escapes the confines of the wiring in an appliance, light fixture, or power tool and takes a shortcut to the ground. When that short cut is through a human, the results can be deadly. About 200 people in the U.S. alone die of ground faults each year, accounting for two-thirds of all electrocutions occurring in homes. To prevent such accidents, Charles Dalziel, a professor of electrical engineering at the University of California, invented the ground-fault circuit interrupter (GFCI), in 1961. Most of the time, his invention does nothing; it just monitors the difference in the current flowing into and out of a tool or appliance. But when that difference exceeds 5 milliamps, an indication that a ground fault may be occurring, the GFCI shuts off the flow in an instant — as little as .025 second. GFCIs are required by the National Electric Code in all new kitchens, bathrooms, crawl spaces, unfinished basements, and most outdoor receptacles. Owners of older houses can retrofit $10 GFCI receptacles at those locations or have GFCI breaker switches (which run as much as $108 for 50-amp models) mounted in the main breaker panel. Portable GFCI adapters, which plug into regular wall receptacles, are available for about $40. “The great thing about GFCIs is that they protect you whether or not your wiring is grounded,” says Bill Grande, manager for safety products at Leviton, a manufacturer of GFCIs. Because lightning and other power surges can damage a GFCIs delicate circuitry at any time, Grande recommends the following monthly test: Plug in a light fixture and turn it on. Then push the device’s test button. If the light stays on, the GFCI needs to be replaced. One of the most common comments I make when inspecting a home is one that points out moisture damage at the exterior door jamb. There are typically a couple potential causes for the damage. It is a common issue that can sometimes be repaired without replacing the door. Using materials that resist rot can help minimize further damage as well as installing a storm door. Depending on your skill set and the amount of damage, this might be a project you could do yourself. Sometimes the damage can extend to the sub-floor or rim joist. These conditions are more difficult to address on your own.